One of the cool things about staying for over a week in Barcelona is that there are plenty of fun day trips to take out of the city. While we’d hoped to spend a day lazing on the beach, the unseasonably cool weather (long sleeves during the day, for example, and coats at night) meant that we spent more time hoofing around to museums and exploring fun neighborhoods. 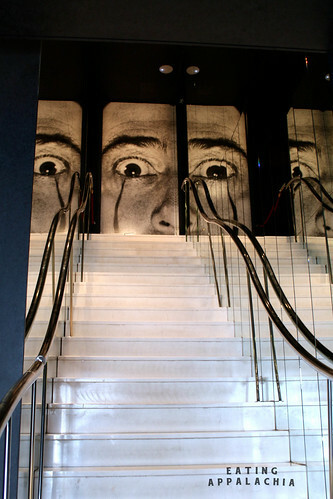 One must, though, was a day trip to Figueres to visit the Salvador Dali Museum. Interestingly, the only time we encountered someone who didn’t know (or didn’t want to speak, at least) English was in the train station when we bought our high speed rail tickets (an international line). Thankfully we pieced enough together to find the English line and get tickets allowing us to spend the better chunk of the day in Figueres–we figured if the Dali Museum was there, then there must be a nice little town, right? Well, the short answer is not so much. So the weirdest part is, for a town that lives on tourism, the high speed train station drops passengers out about a mile away from the town center. And there are no signs or directions for how to get to the museum/town center. No sidewalks either. Good thing we brought a map? 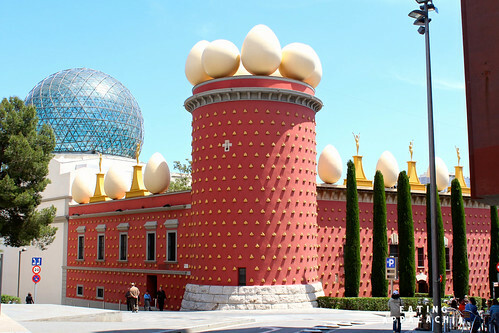 After hoofing through a kindof seedy/rundown area (Figueres was the only place I felt I really saw the recession in Spain), we finally found the Dali Museum–utterly recognizable in it’s red & gold polka dotted glory. After buying tickets, we went inside the building and wandered around the several floors. Yes, there’s the Mae West Room which is pretty cool and the Rainy Taxi in a courtyard, but honestly? It’s not worth the trip. 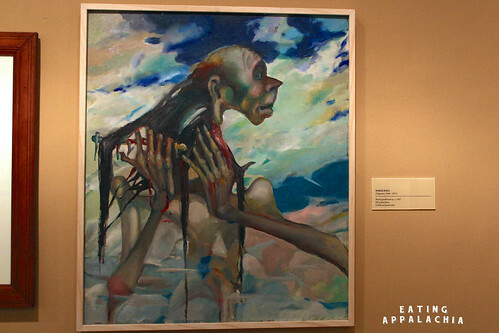 I’m a big Dali fan, actually, but after having visited the museum in St. Petersburg, Florida, there’s really no comparison. Figueres feels like all the leftovers–line drawings from his early period, the non-famous paintings. It’s not a bad museum, just not nearly as well curated as the Florida one. Since we had the entire day to kill and it was only 11 am (we literally only spent an hour in the main museum), we wandered around town. There was a nice little farmers market, some restaurants, but not much else. No shops to walk into, not much to do. And all the restaurants were very touristy feeling. Unfortunately this put me into a really cranky mood which G had to put up with. Sigh. We hadn’t eaten much for breakfast, so we decided to get lunch and drag it out as long as possible. After reading at least five or six menus and feeling utterly uninspired, we stumbled upon Txot’s Sidreria–a cute tapas place that, I just now realized, specialized in the area’s cider. Seriously? I didn’t know we ate lunch in a cider bar? I’m really bummed now (I guess the apple in the sign makes more sense now…). So. 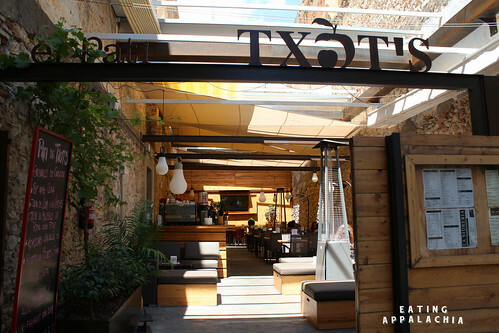 If you go to Figueres, please go to Txot’s and try some local cider for me! Anyways, the courtyard was lovely and the food not too shabby either. 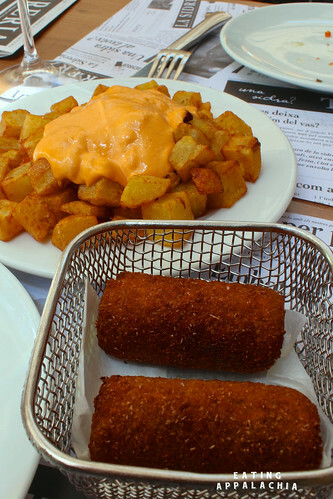 We split some mushroom croquettes & patatas bravas to start–two fairly standard dishes that were nice enough. Nothing spectacular, but what isn’t good fried? And who doesn’t love potatoes smothered in a slightly spicy aioli? Next up was some local chorizo in cider. Hands down the best dish we ate at Txot’s. 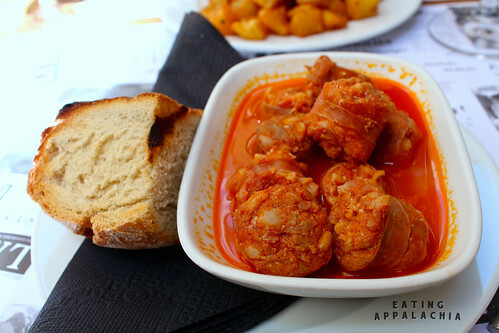 The chorizo was spicy and the broth acidic and spicy and perfect for sopping up with the fresh crusty bread served alongside. 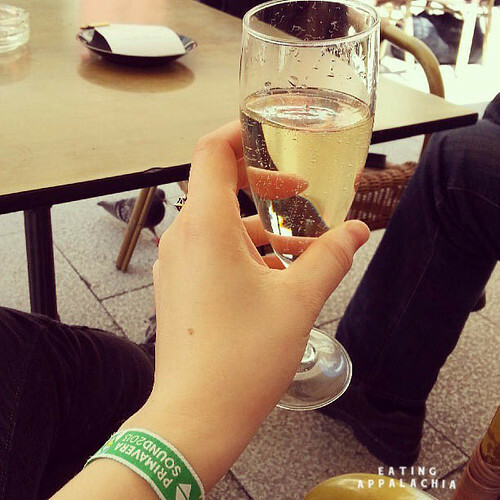 Absolutely delicious–and also a cue that we should have been drinking cider there. If only I’d known. If only there’d been a drink menu. Still a little bit hungry, we ordered two of the little sandwiches on the menu, assuming they’d be small, tapas-sized. Nope! They were actually pretty big, but given how tasty they were, we really didn’t have a hard time scarfing them down. 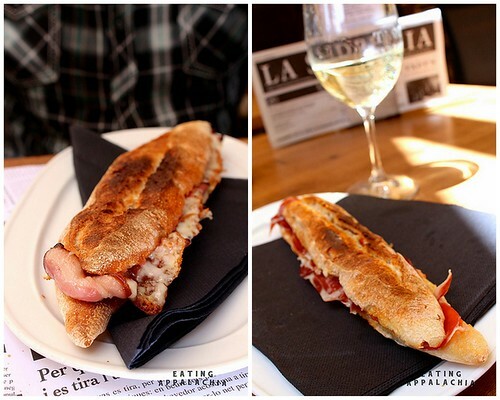 On the left is the bacon & bleu cheese flauta–a cheesey, crusty, salty sandwich of uncured bacon and funky cheese. Definitely a good bar bite. The one on the right is the Iberian ham flauta which was pretty much just ham and bread. But since the bread was good and crusty, the jam fantastic, you really can’t go wrong. 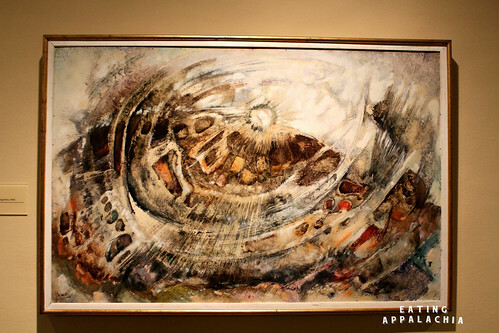 Sated, we tromped back up to visit the second part of the Dali Museum–the jewels. Housed in a separate building to which you can get sole admission (we paid for both with our Dali ticket), I wasn’t expecting much out of the jewels, but I actually enjoyed it much more than the main museum. It’s hard to adjust to the pitch black rooms illumined only by the jewel cases, but I loved the clandestine, special feel it gave the museum. And in the jewels you can see more the creative, outlandish genius of Dali–that genius that I felt lacking in the main museum. 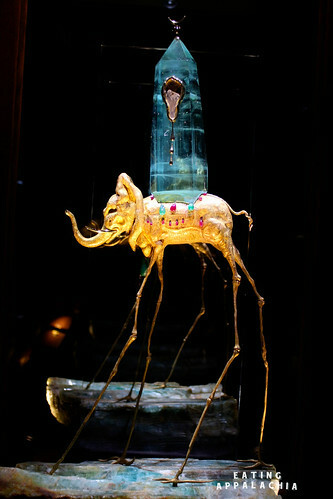 Some of the jewels even moved thanks to little motors and such, like this elephant whose legs walked! Pretty cool, right? But, unfortunately, the jewel museum was rather small and only killed about 20 or 30 minutes of our time. Our goal at this point was to go as slowly as we could with whatever we did since our train didn’t leave until 7 pm. Obviously drinking factored heavily in this plan. Cheap, delicious cava? I do love you. We visited the Toy Museum, of which there are one or two funny pictures on G’s camera that I don’t have copies of yet, but, overall, definitely not the most fun toy museum I’ve ever been in. Not that I’ve been in a toy museum. But I figure toy museums ought to be fun, right? This one was just kind of sad. And creepy. But that’s ok, because we dragged our way through it to waste 45 minutes or so. Afterwards, we found a pretty square and found some women drinking giant goblets of sangria so we decided that would be a nice interlude. Which it was (I thought I took a picture of it…I guess not), but it also was the kind of sangria with liquor in it, which we didn’t realize and each ended up being pretty drunk by the end of our glasses. You know you’re on vacation when you get day drunk. With a nice buzz, we wandered off to the other local museum, the Empordà Museum. I wasn’t expecting much out of the museum–we had it all to ourselves and the docent seemed miffed that someone actually wandered into the place–but it ended up being my favorite museum in Figueres. I’m not very knowledgable in art history and really knew very little about Spanish art, but I was completely captivated by much of the modern collection. 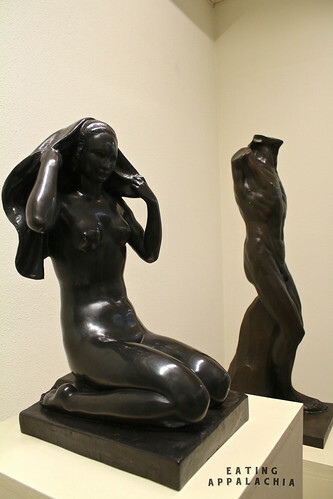 There was almost an entire floor dedicated to sculpture and these pieces by Frederic Mares Deulovol (the namesake of the museum in my first post!) were some of my favorites. Another artist that I knew nothing about before the museum was Maria Baig, a local Figueres artist who I guess isn’t considered to be much because I can’t find a single thing about her on Google. Art history buffs, can you help me out? Her pieces were incredible! Eventually, it was time to hike back to the train station and take the high speed back to Barcelona. Was Figueres everything I thought it would be? Definitely not. But did I end up having a fun day even though it started out disappointing? And did several glasses of wine help out? Oh most definitely. 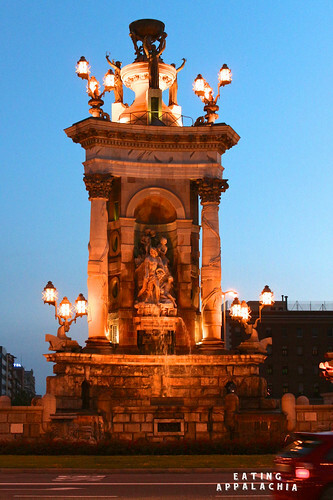 If anything, that’s one thing Spain has going for it–incredible wine. And fantastic museums that no one visits! Funny how people can go to the same place and have a completely different experience! 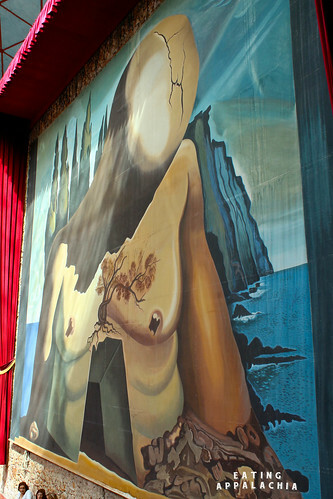 I love Dali, Spain not so much – but I found both the Dali Museum and Figueres to be the best things I’ve experienced in Spain. We walked from the regular train station and also stumbled across a giant, vibrant market (selling food, snacks, craft and more) as well as several cute handicraft/artisan shops. There was so much to see and do, we didn’t even make it to the Toy Museum or the Citatel. I was really sad to spend only one day there!